Marshyangdi Hydropower Station is a peaking run-of-river power station having installed capacity of 69 MW with 3 units of 23 MW each. It is located on the west bank of Marshyangdi river in Aanboo Khaireni VDC of Tanahun district at about 114 km west of Kathmandu. 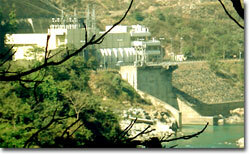 The power house was commissioned in the year 1989 with designed annual generation of 462.5 GWh.